David W. Chapman served as dean of the Howard College of Arts and Sciences 2001-2016. He came to Samford University in 1990 as Associate Professor of English and Director of Samford's Writing-across-the-Curriculum Program. He served as professor-in-residence at Samford's London Study Centre in 1994. In 1996 he was named associate dean of Howard College and played a key role in the development Samford's interdisciplinary core curriculum. 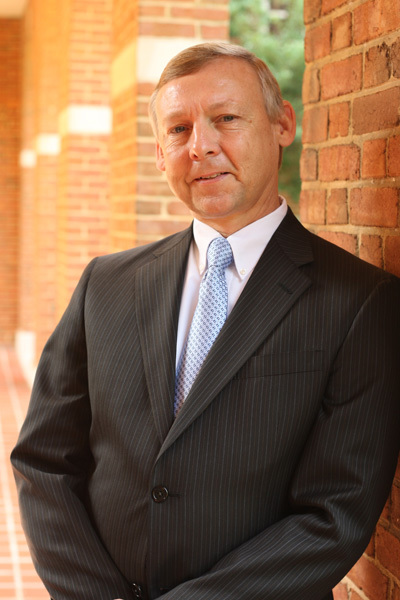 He was also instrumental in coordinating the work of the College in support of Samford's Problem-Based Learning(PBL) Initiative, funded by a million dollar grant from the Pew Foundation. He received a Department of Education grant in 2000 to work on a joint PBL project in the humanities with Maastricht University in the Netherlands. He also helped coordinate Samford's successful application for a two-million-dollar grant from the Lilly Foundation to assist students in theological exploration of vocation. A native of Tulsa, Oklahoma, Chapman holds a Ph.D. in English from Texas Christian University, an M.A. in Modern Letters from the University of Tulsa, and a B.A. in Speech Communication from the University of Oklahoma. Dr. Chapman has published more than 50 articles and one book, The Power of Writing. His articles have appeared in publications such as the Chronicle Review, Change, The Journal of General Education, and The Journal on Excellence in College Teaching. He was the editor of Alabama English (a publication of the Alabama Council of Teachers of English) from 1993-95. He serves on the International Planning Committee of the Pan-American Network for Problem-Based Learning, and the Committee for Private School Deans of the Council of Colleges of Arts and Sciences. He is a frequent speaker at higher education conferences and workshops on writing across the curriculum, core curriculum, and problem-based learning. In addition to his academic achievements, he has ridden 50 miles in the annual "Old Howard" bike ride and climbed to the top of Waynu Picchu in Peru. In his spare time, Chapman enjoys biking, playing racquetball with other professors on campus, and occasionally acting in Samford plays such as Richard III. Chapman currently teaches English courses, Cultural Perspective classes and the Western Intellectual Tradition for the Fellows Program. He was inspired to teach by the movie, Conrack, an autobiographical movie about American author Pat Conroy. He recounted how he walked away from the movie inspired by the influence and impact teachers can have on their students. “John Howard,” The Encyclopedia of Corrections, edited by Kent R. Kerley (Editor-in-Chief) and Heith Copes, Spencer De Li, Jodi Lane, and Susan F. Sharp (Associate Editors). Wiley. 2017 (anticipated). A Samford Life. Howard College of Arts and Sciences. Samford University. 2015. “My Life as Socrates,” Chronicle Review, 13 Dec. 2015. “Staying Alive in Teaching and Research,” The Resource Handbook for Academic Deans. Laura L. Behling, ed. San Francisco: Jossey Bass, 2014. “It Happened in Cartagena: An Educational Catastrophe that Succeeded In Spite of Itself,” Change 45 (July/August 2013), 44-46. “Following the Family Trade.” Chronicle of Higher Education. 12 Dec. 2012. "On Being a Christian University," Seasons 27 (Fall 2010): 22. "Hitting the Rankings Jackpot," Change: The Magazine of Higher Learning, Nov-Dec 2008: 14-16. "Problem-Based Learning in Cross-Cultural Groups," with Mary Sue Baldwin, Margaret Carlisle, and Amanda Borden, PBL 2006 Conference Proceedings, July 2006. "In Search of John Howard," Seasons 22 (Spring 2005): 10-13. "Undergraduate Research and the Mandate for Writing Assessment," Peer Review 6 (Fall 2003): 8-11. "Trendy or Barometer of Quality?" Seasons 20 (Winter 2003): 8-9. "When Study Is the Star," Chronicle Review. 12 Sept. 2003: B5. "Words that Make a Difference: PBL in the Communication Arts Course." The Journal of General Education. 51.4 (2002): 257-71. "Brave New (Cyber)World: From Reader to Navigator" Teaching Writing: Landmarks and Horizons. Ed. Christina Russell McDonald and Robert L. McDonald. Southern Illinois UP, 2002. “Streetcars, Cable Cars, Trolleys, and Trams: Electrifying Transportation in the Victorian Age,” Interdisciplinary Nineteenth Century Studies Conference. Houston, Texas. March 27, 2014. “Creating a Problem Is a Good Thing,” (Preconference Workshop.) PBL International Conference. Concepcion, Chile. January 14, 2014. “Conflicts and Consensus.” (Roundtable Discussion.) PBL International Conference. Concepcion, Chile. January 15, 2014. “Relational Teaching in the PBL Classroom,” Third International PBL Symposium. Republic Polytechnic. Singapore. March 8, 2012. “Road Blocks, Detours, and Lost Drivers: Overcoming the Challenges of Problem-Based Learning Experiences. Third International PBL Symposium. Republic Polytechnic. Singapore. March 7, 2012. “College-Based Recruitment,” Council of Colleges of Arts and Sciences. Montreal, Canada. November 11, 2011. "Creating Community in the PBL Classroom." PBL International Conference, Sao Paulo, Brazil. February 8, 2010. "Problem-Based Learning for Family and Consumer Sciences," Alabama A&M University, Huntsville, AL, March 6, 2009. "Crossing the Border: PBL that is International, Interdisciplinary, and Interactive." (Preconference Workshop). Dana Basinger, David Chapman, George Keller, and Charles Workman. PBL International Conference, Colima, Mexico. January 26, 2008. "PBL and Faculty Development." (Plenary Discussion Panel) David Chapman, George Watson, Peter Bouhuijs. PBL International Conference, Colima, Mexico. January 27, 2008. "Problem-Based Learning in Cross-Cultural Groups," (with Amanda Borden), International Conference PBL 2006 ABP, Lima, Peru, July 19, 2006. "Developing Intercultural Competence," Roundtable Discussion Leader at the Conference of Colleges of Arts and Sciences (Vancouver, BC), November 3, 2005. "Life Lessons: The Role of Life Writing in the Mission of the Christian College," Faith in the Academy Conference, Messiah College (Grantham, PA), October 1, 2004. "International and Interdisciplinary: Transatlantic Cooperation for Problem-Based Learning in the Humanities," Improving University Teaching Conference, Bern, Switzerland, July 13, 2004. "Cross Boundaries: International PBL Curricular Development," PBL 2004 International Conference, Cancun, Mexico, June 16, 2004. "Collaborating on the Development of International Curriculum," (with Lies Wesseling, University of Maastricht), EC-US FIPSE Project Directors' Meeting, Halifax, Nova Scotia, Nov. 25, 2002. "PBL in the Humanities," [Preconference Workshop] PBL 2002: A Pathway to Better Learning, Baltimore, MD, June 16, 2002. "PBL in the Humanities: What’s the Problem," PBL 2002: A Pathway to Better Learning, Baltimore, MD, June 17, 2002. "EC-US Cooperation on PBL," PBL 2002: A Pathway to Better Learning, Baltimore, MD, June 17, 2002. "Bringing Down the Barricades: An Integrated Communication Arts Course," National Communication Association, Atlanta, GA, November 3, 2001. "Service Learning in Communication Arts," National Association of Student Personnel Administrators, Birmingham, AL, January 25, 2001. "Developing a Curricular Model for PBL in the Core Curriculum," Panel. PBL 2000, Birmingham, AL, October 30, 2000. "Overview of the PBL-PR Grant," Panel. PBL 2000, Birmingham, AL, October 30, 2000. "Lessons Learned," Plenary session. PBL 2000, Birmingham, AL, October 30, 2000. "Integrated Communications as a Revival of Classical Rhetoric," College Composition and Communication, Minneapolis, MN, April 14, 2000.